Very little is known about the early settlement of the village and when and how it developed to its current form with the main village being in the centre of the parish in a linear development along a ridge of high ground running north-east from St Mary’s church. This now includes the minor settlement at Burton End while the hamlet of Streetly End is in the south of the parish. Documentary evidence is scarce while archaeological investigation has been limited and mainly confined to the north of the parish around Yen Hall. Archaeological evidence of prehistoric activity (Mesolithic, Bronze Age and Iron Age) has been found in the parish, mainly around Yen Hall and the shallow valley to the north-west of the High Street. Finds associated with a Romano-British ‘villa’, metal-working site and pottery kilns (3rd and 4th century AD) have been recorded in the same area, as has evidence of two 6th century Anglo-Saxon burials. Stray finds around Streetly End may be related to a Roman villa site excavated in neighbouring Horseheath parish, while Anglo-Saxon jewellery was recovered from a pipe-line trench near Streetly Hall. A few stray finds from the Roman period and some Anglo-Saxon pottery have also been recorded in the area around the church. The earliest documentary evidence comes from an Anglo-Saxon charter of AD 974 relating to land in West Wratting in which boundaries with Yen Hall (eanheale) and Wickham (wichamme) were mentioned. The Domesday Book of 1086 recorded three estates or manors – Yen Hall (Enhale), Wickham (Wicham) and Streetly (Stradleia). A church was recorded about 1200 but the present building dates from the 14th century. 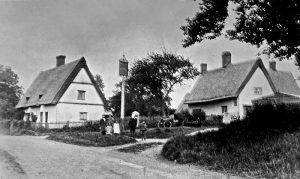 Dwellings were mentioned at Burton End (Bovetoun) from the 1340s and cottages and a green at Streetly (End) in the mid-15th century. 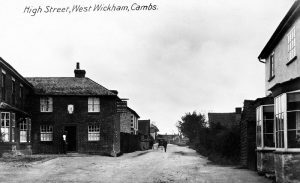 The Alington family from Horseheath were acquiring land in West Wickham from the early 15th century and by 1600 they owned most of the parish. 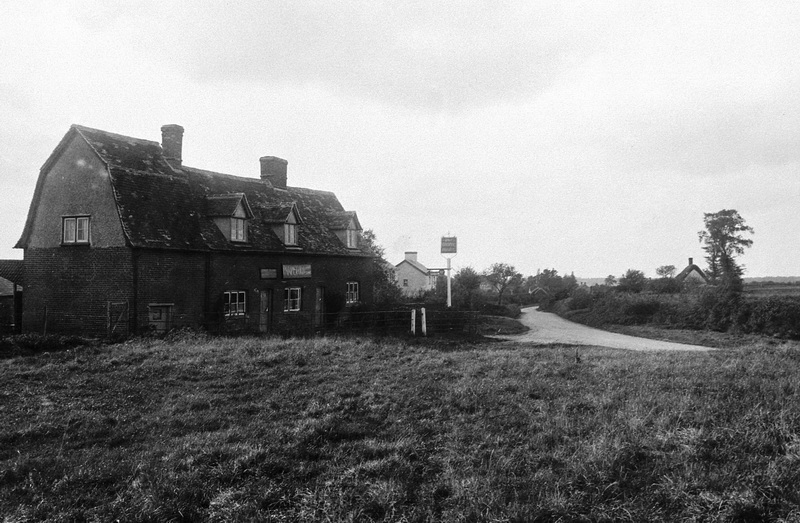 In the post-medieval period, with the parish economy based on agriculture, each manor retained its separate identity as a tenanted farm of the Horseheath estate. 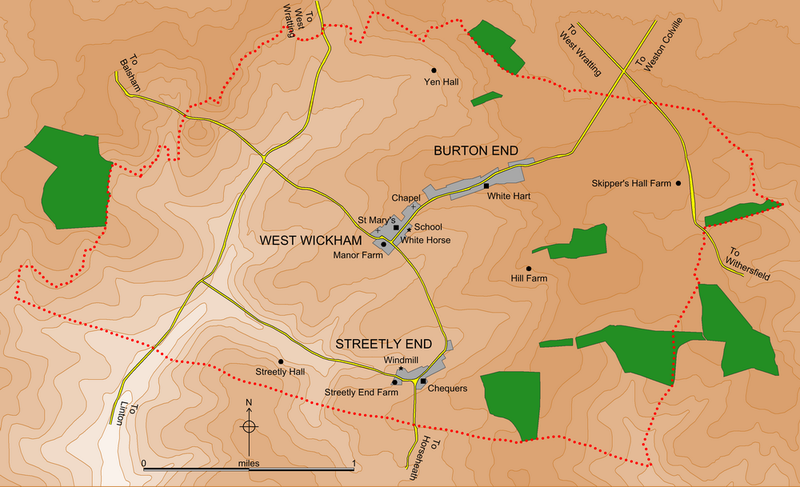 Settlement was concentrated in three areas – around the church, at Burton End and Streetly End. Streetly End with former Chequers PH on right. Photograph early 20th century. At the end of the 18th century the West Wickham part of the Horseheath estate was bought by the Earl of Hardwick of Wimpole Hall. The agricultural landscape changed when the 2nd Earl obtained an Act to enclose the parish in 1812; a process not completed until 1822. 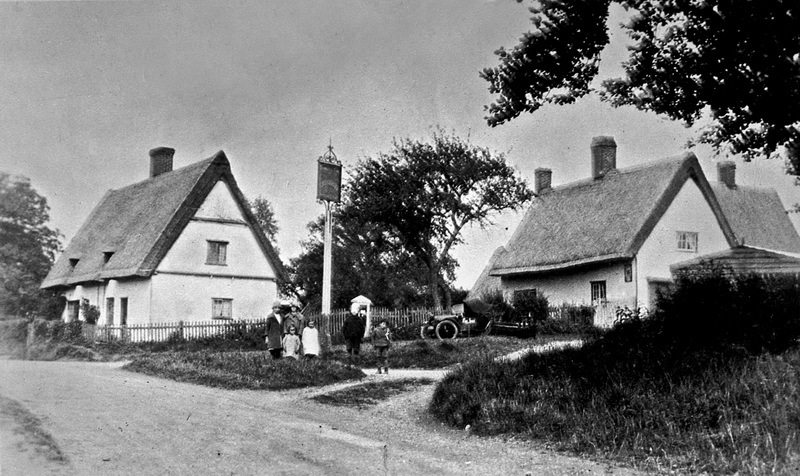 The village was then largely self-sufficient with a range of tradesmen and services including a public house in each of the three settlements. The population increased dramatically during the first half of the 19th century but this was not sustainable and people began to leave in search of work and housing. This decline was not reversed until the mid-20th century. Janet Morris, West Wickham & District Local History Club.